ABC Reprographics provides Xerox copying that Denver clients appreciate. Each project is completed with precision, using the highest resolution necessary for your print job. We offer black and white, full color, or mixed copies for all of your important projects. For instance, we create high resolution and high speed reports, specifications and brochures. Each document is laid out just right with all visuals, such as charts, graphs, and images that you need. Otherwise, you can use our Xerox copying in Denver for producing single-page newsletters, flyers and more. In the process, we welcome your ideas and never carry out a job unless we know for sure we have included all that you want in it. 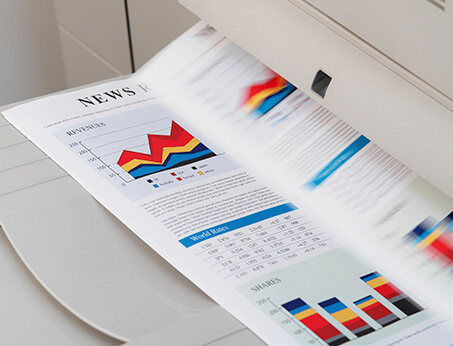 You can call us to deliver your paper copies, or we will send you the digital files. Any time you want to print your stored files in the future, they will be available 24/7. Call us or email us to place your order. We also have pick-up and delivery Denver copy services to make life even easier for you. Please let us know how ABC Reprographics can help you fulfill all your copy and print orders. We can also speak with you personally to explain some of our custom order options. Then, our dedicated team with an extensive professional graphics design history will get to work. In addition, we have a highly-successful group of copywriters more than qualified to handle composing any of your content. Please call us and we will put together the right marketing materials for you. Otherwise, we can print what you already have for us stored in your files or sent to us via email.